The Faroe Islands is a place not many have heard of. An autonomous country within the Kingdom of Denmark, the Faroe Islands are located approximately 300km north of Scotland, and halfway between Denmark and Iceland. Its a land of contrasts - modern subsea tunnel infrastructure and helicopter services connecting remote farming villages with more sheep than people. Although its a sub-arctic island, its location in the Gulf Stream keeps temperatures above freezing year-round. Which means there isn't really a bad time of year to visit - we went in mid-April of this year (2017) and got rain, wind, sunshine and snow. The Faroe Islands is a group of 18 islands, with only one major island (Litla Dimun) uninhabited. We spent most of our time on Vagar, Streymoy, Eysturoy and Suduroy. I'll focus on a dozen or so key photo spots that I visited over my week on the islands. You'll fly into Vagar airport, on the island of Vagar, and we chose to spend a couple of nights here in an AirBnB in Midvagur (down near the docks). If anyone is familiar with the islands, you'll know that I missed several locations (notably Kalsoy). 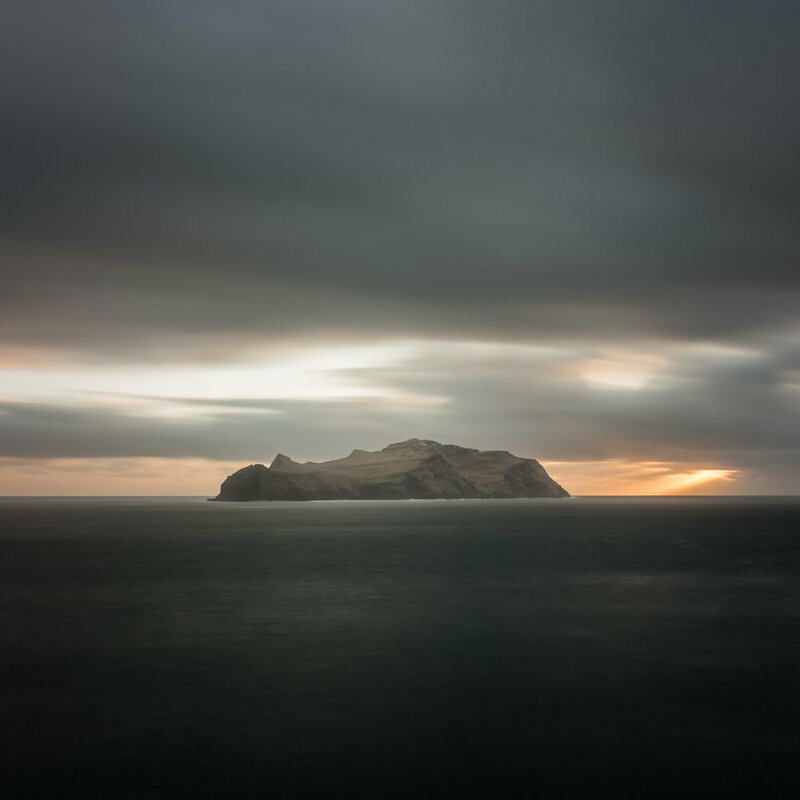 There were days when the weather just didn't play ball and I couldn't get to where I wanted to go - such is life on a trip to the Faroe Islands. 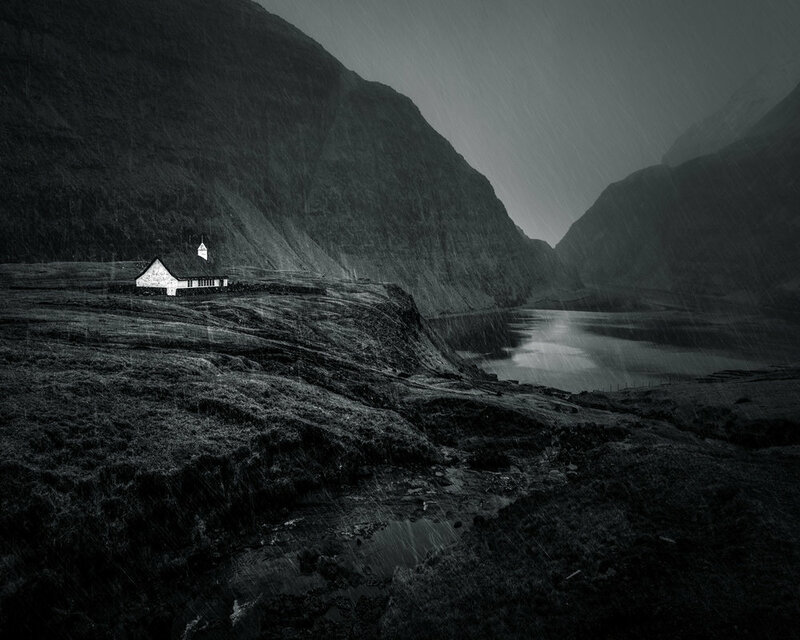 The classic Faroe Islands photography location. If you've seen a picture of the Faroe Islands, its probably this spot you've seen. Until 2004 this location (and the village located here) did not have a road connection to the rest of Vagar. Neither could it be accessed by boat for most of the year, so the only way to get here was to hike over a 400m high mountain pass. Location - very easy spot to get to. As you'll see above, this location is very easy to get to. There is only one road in and out, so take the 45 out from Sorvagur. You'll pass Bour on your way, which is a great little village with awesome views over to Tindholmur. Continue through the tunnel, and down towards Gasadalur (watch the road in, its steep and slippery when its wet). The best spot to park is marked on the map - there is a little pull-out parking area near a fence that fits two or three cars maximum (watch out for the little sheepdog that likes to play fetch with stones). If this little area is full then you can continue into the main village and park there, and wander back down the road. Composition wise there aren't too many options - the waterfall (Mulafossur) is so iconic and you can really only shoot from one or two spots. The best spot (or near to it) is marked on the map above (and its from where the shot below was taken). Gasadalur from the classic view point, after a dusting of snow. You also get a great view over the island of Mykines. In addition to these shots, you can also climb down a set of rocky stairs to the shoreline (the area circled in red in the map above). On the few times we visited this spot the winds were blowing hard, it was raining or had just finished snowing so we never felt confident enough to get down and up those stairs in one piece. Easy to fold into your road trip to Gasadalur. The village of Bour is small and quaint, and has a couple of the classic turf-roofed houses. 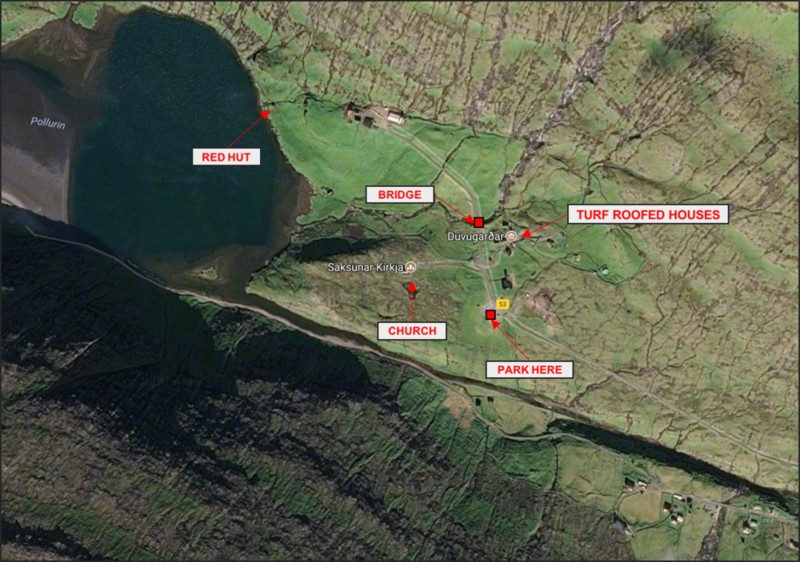 The village is located between Sorvagur and Gasadalur, a short turn-off from the main 45 road. Watch out for the sheep who roam the roads here as if they own them. As well as the huts and houses themselves, there are great views out across the water to the rocky Tindholmur. 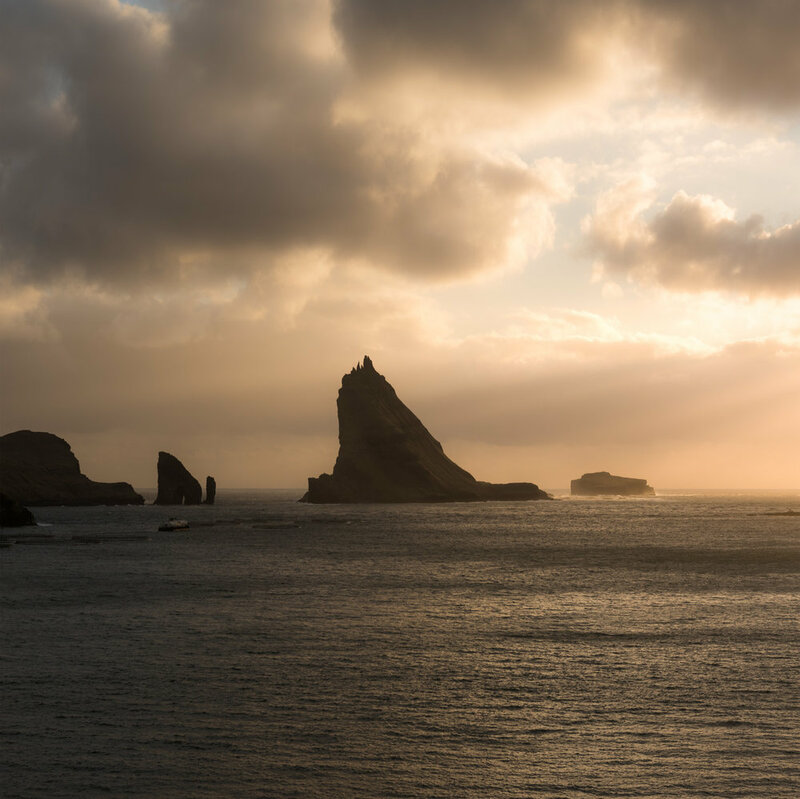 You'll also come across a few viewpoints with small parking areas on the road between Gasadalur and Sorvagur, so pull over and have a look. The view across to Tindholmur. You'll see this place noted as either Sorvagsvatn (what the people on the west in Sorvagur call it) or Leitisvatn (what the people in Midvagur and Sandavagur call it). This is where you can get the classic "floating lake" photo that you'll probably have seen on Instagram. Getting here is reasonably easy, but it requires a hike of a few kilometres with a steepish climb at the end. The high cliffs at the end of the hike are very exposed, so don't go if the weather isn't looking good and be prepared to turn back if it gets bad. Overview of the walk out to the cliffs. Parking can be a little tricky to find - there is a small slip road right before the bend in the main road that you can park in. Its very easy to miss the turn into the parking, as it isn't signed. Parking location and start of the trail. Wander alongside the main road until you get the well established path. Pass through the gate (close it behind you, this is still grazing land) and continue past the working farm / stock yard. You'll follow a rough path alongside the lake - we stuck to the firmer ground and the worn path where it was obvious. Towards the end of the lake you'll see the path steepen and head up to the left. Follow the path upwards as best you can (use the dried river beds as a rough guide). There aren't any signs up here, but you'll come across some old ruins and stone work which indicate you're in the right place. To get the classic view you've seen from here you need to get super-close to the edge of the cliffs to your left (if you're facing straight ahead when walking up the hill). The classic "floating lake" viewpoint. Try and not fall off the edge. 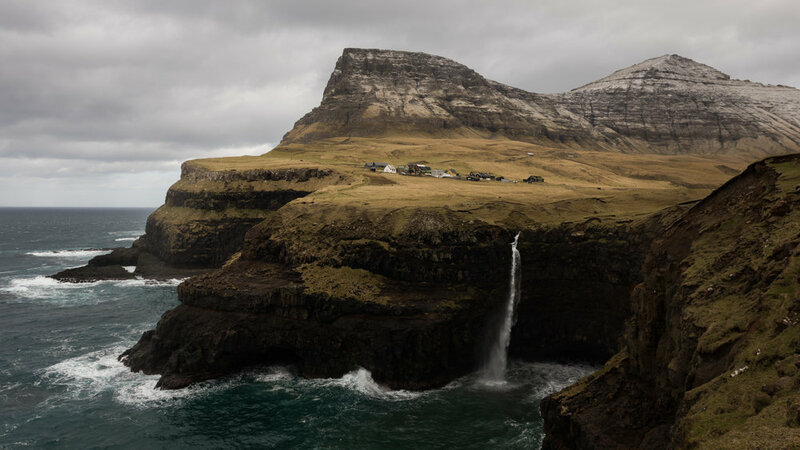 One of the best things about the Faroe Islands is that because the islands are so close together you'll often get multiple different angles of many of them, and they look completely different from place to place. This spot isn't really an official "wow" viewpoint or in the guidebooks as a must see, but it caught my eye as we were driving past it on our way back to our accommodation in Midvagur one day. Something about the fishing farm nets, sea fog and low cloud made this scene look almost alien in nature. Koltur and Hestur look far narrower and precipitous from this location (as opposed to how they look from the west shores of Streymoy). Like many spots, there isn't a designated view point or parking lot, so just pull into a parking bay wherever the view looks best. 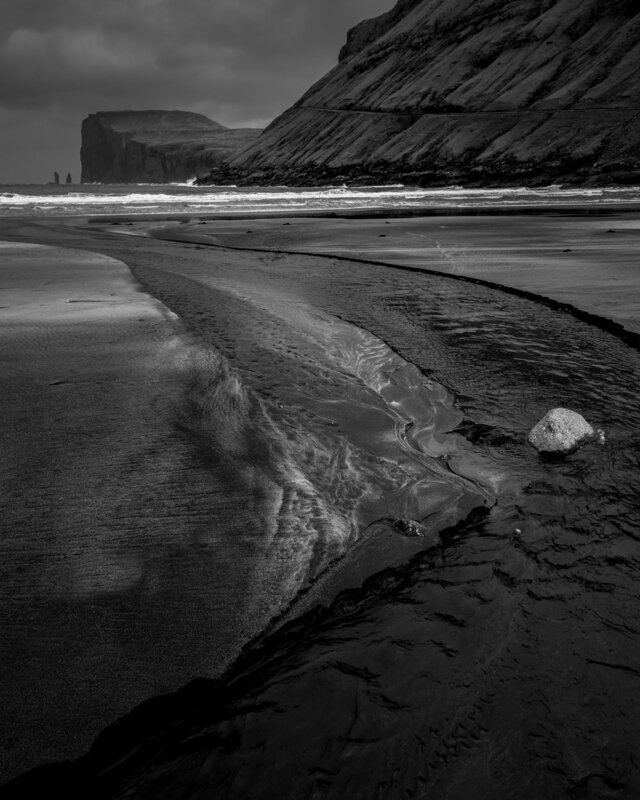 Another the classic Faroe Islands photo locations, and a very popular tourist destination. To get here, take Road 53 from near Streymnes. If this is one of your first stops on arrival to the Faroe Islands then Road 53 will probably be your first windy, single land road. Its not too bad and its sealed all the way, just keep an eye out for oncoming traffic and make use of the passing bays. Be careful if its snowed recently though. Towards the end of the road keep to the right (so you don't go into the little village on the left). You'll probably see the little church first when you arrive into the old village of Saksun. Park in the parking bay just off the road and head out to explore. The little turf-roofed huts you've seen in the photos are up the hill on the right-hand side of the road - one of these is now a museum. Its best to have something wide here lens-wise. I shot the above at around 24mm (full frame) and could have gone a few mm wider. We also lucked out and got a bit of snow as well. Down in front of these huts there is a little white church (you'll see it from the carpark when you arrive). I found the best spot to get both the church and lagoon in the one shot was from the bridge on the main road. There isn't much more in Saksun itself. There is a little farm with a red cottage further down the road from the church and grass roofed huts, but it was snowing pretty hard by the time I'd finished up and I couldn't really feel my fingers. On the road out of Saksun you'll come across many little huts, often set against a backdrop of rising hills. There isn't any best spot in particular - just pull in when you see something you like (and theres enough room beside the road to park). The hut above isn't a particular place of note, just one of the little scenes you see from the car. The combination of the fresh snow on the mountains and nice light made it a must-stop location. The northernmost town on Streymoy, and home to a great black sand beach and some fantastic rock structures. Its also the main surfing beach on the islands, if thats your thing. There isn't much foreground interest on the beach except for some rocks and the channels cut into the sand by the runoff from the rivers behind the town. Off in the distance in the shot above you can see the rock formations of "Risin og Kellingin" (the Giant and the Witch) - I'll let you look up the story behind these online. Above you can see a closer view of these rocks, shot from the beach at Tjornuvik with a 200mm lens. Again, this isn't a designated viewpoint, its just one of those scenes you come across as you're driving around. 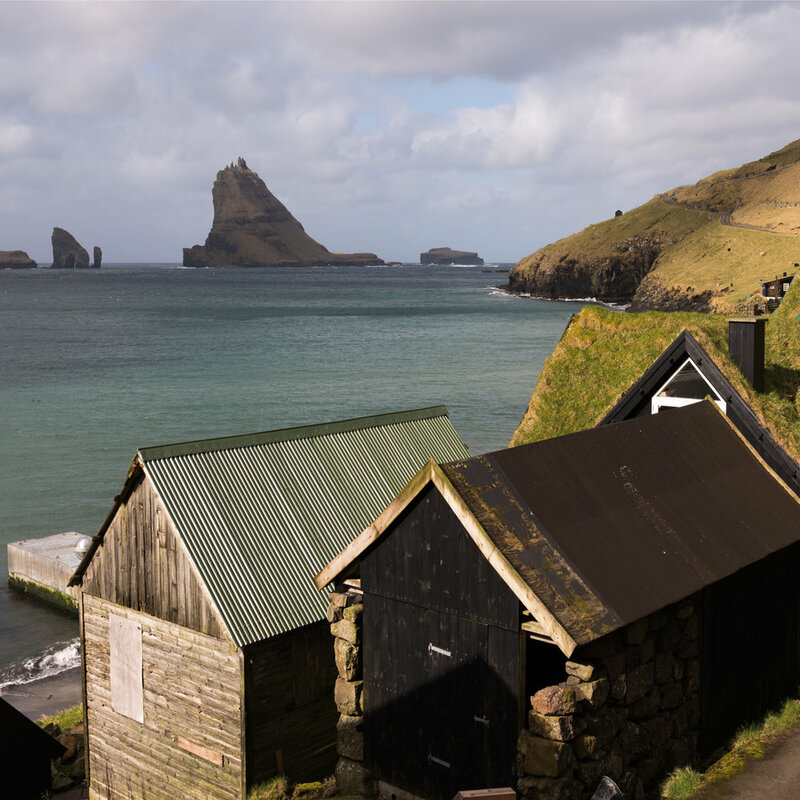 Its classic Faroese scenery - hills, grass-roofed huts and sheep overlooking the ocean. You can find this particular spot on the road between Funningur and Eidi - be careful on the road if it has been snowing, as it can get hairy. Stop off and climb Slættaratindur while you're here if you're feeling adventurous - at 882m high its the tallest mountain on the Faroe Islands. Located at the very north end of Eysturoy. The town is best know for its gorge (Gjogv translates literally to gorge), which is used as a natural harbour. I couldn't find a composition that worked at the gorge - the light was harsh out towards sea and the tide was low. I did find this great little hut that was framed by a couple of peaks. The road in is another windy single-lane deal, so take it slow. Oh, and these huts are all people's houses - shoot from a distance and be aware that locals are just trying to go about their day. And don't stare through the windows. Stay tuned for Part 2, where I'll go into some more detail on the island of Suduroy. San Carlos de Bariloche was to be our next stop after El Chalten. Looking at a map it was clear that there was a lot of empty space between those two places, and we hoped there would be something (anything) around the mid-point for us to break-up the trip. Some Googling revealed the marble caves at Puerto Rio Tranquilo as the most promising option. Unfortunately there is a lack of up-to-date information about these caves online, so I've put together some pointers on how to get there. Relative location of Puerto Rio Tranquilo. What are the Marble Caves? The marble caves (which include the caves, as well as the Capillas de Marmol - the Chapel of Marble) are a collection of natural marble formations which have been shaped over time by wind and water erosion. They are located a short speedboat ride from the town of Puerto Rio Tranquilo in Chilean Patagonia, which can be reached from either Chile or from across the border in Argentina. Tourism in the area is nascent compared to other places in Patagonia (especially El Chalten and El Calafate), so things move slowly and sometimes unexpectedly. If coming from Argentina and you don't have your own car, I'd suggesting giving yourself three or four days to get into and out of Rio Tranquilo. We arrived into Puerto Rio Tranquilo via the Los Antiguos-Chile Chico border crossing, originating from El Chalten. This post will cover only this route in detail. 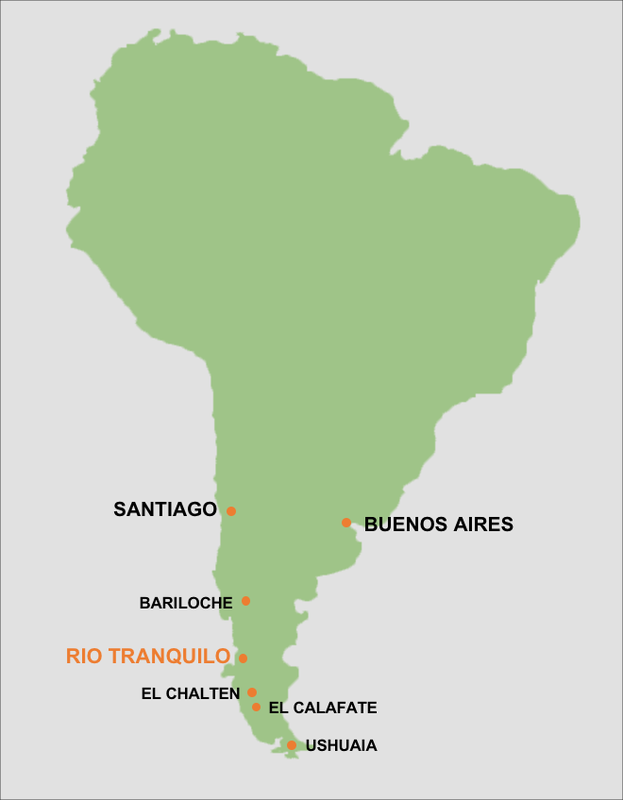 You can see from the map below there are a few key towns in the area - Los Antiguos, Chile Chico and Puerto Rio Tranquilo. In broad terms, you arrive in Los Antiguos via Route 43, cross the border to Chile Chico and then take Route 265 and 7 to Rio Tranquilo. If you're already in Chile (say in Pucon), you can get down to Rio Tranquilo via the Carretera Austral. We ran into a few people doing this with rented 4x4s and vans. We took a Chalten Travel bus from El Chalten to Los Antiguos. The bus left El Chalten on a Friday evening (around 7:30pm) and arrived into Los Antiguos at around 8am on Saturday morning. Cal-Tur also run a service between El Chalten and Los Antiguos. It will also be possible to arrive into Los Antiguos from Bariloche if you are travelling in the opposite direction. This is trickier than it was a year or so ago. The Argentinian government has clamped down on Chilean tour and taxi operators entering the country, requiring a US$100 payment to cross into Los Antiguos from Chile. As a result, it doesn't make any sense for taxi drivers to take a US$10 fare (at the most) to cross the border. The Argentinian border crossing is only a couple of kilometres outside of Los Antiguos and is easily walkable. The office doesn't open until 8am, so if you arrive early into Los Antiguous on an overnight bus you'll have some time to kill. From the Argentinian border control office its another 3km or so to the actual border, where you'll see a couple of signs and a small parking area / turning bay. If you manage to grab a taxi in town it will drop you here. We got lucky here and managed to catch a ride into Chile Chico in a shared van - the driver charged us 2,000 pesos (around US$1.50) to get into town, including waiting at the Chilean border control. The driver was making a few trips back-and-forth to the crossing, so chances are good that you'll be able to snare a ride into town from the border. The van or taxi will drop you off on the main street in Chile Chico. There are a few ways to get to Rio Tranquilo from Chile Chico - the trip is around 5 hours by car so hiking isn't an easy option. Several people we met in town were trying to hitchhike (far more common and safer in this part of South America than elsewhere in the world) but the roads were quiet and they weren't having much luck. The easiest (but not cheapest) way we found was to take a shared van which leaves from outside the Martin Pescador store on Avenida O'Higgins (the main street in town), next to the supermarket. This option wasn't cheap - 20,000 pesos per person each way (~US$30). Tickets are purchased from the Martin Pescador store (just hang around the van if nobody is there, someone will sort you out) The van leaves Chile Chico at around 11am, so if you choose to walk all the way from the border you'll need to hustle. The van gets you into Rio Tranquilo late in the afternoon (around 5pm or so from memory), but you'll have a couple of stops along the way. The driver will help you find some accomodation in town - they will usually drop you off at an "affiliated" hostel. If you don't like the look of this option then there are a few other places in town. This van you rode in on returns to Chile Chico the next day, leaving Rio Tranquilo at around midday (confirm with the driver). This gives you enough time to take a morning cave tour before catching the bus back. All of the boat tour companies have small offices on the waterfront - you'll see them all as you drive into town. As far as we could tell, all boats offered the same tour for the same price (9,000 pesos per person) and depart between 8am and 9am in the morning. You're out on the water for around 2 hours, ducking in and out of the caves, driving through larger formations and getting up close the main cathedral formations. Just reverse the steps you took to get to Rio Tranquilo. The bus will get you back to Chile Chico late in the evening (after sunset), and you can ask the driver to drop you at a hostel. We stayed at Hospedaje Don Luis on Balcamdea, and can recommend it. The next morning you can take a taxi to the border crossing (ask the hostel to help if needed). Like your trip across the border the first time, you'll be dropped off at the actual frontier, from which point you need to walk or hitch into Los Antiguos. We stayed a night in Los Antiguos as our bus to Bariloche left at 6am, which wouldn't have allowed us to get through the border controls (which open at 8am). There you have it - an up-to-date guide on how to get to the Marble Caves of Puerto Rio Tranquilo from Argentina! Lone Tree in Lago General Carrera. El Chalten had long been near the top of the list of places I wanted to visit in Patagonia. Being at the foot of both Mt Fitz Roy and Cerro Torre, El Chalten has a well-earned reputation as the hiking and climbing capital of Patagonia. Fitz Roy Massif from Mirador Los Condores. We arrived into El Chalten from El Calafate, which is located approximately 200km to the south, on the other side of Lago Viedma and Lago Argentina. We took a morning bus with Chalten Travel and arrived into the El Chalten terminal (at the south end of town) around 5 hours later. Cal-Tur and TAQSA also run on this route (we found Chalten Travel to be a bit cheaper than the other options) - more details can be found here. When you arrive into El Chalten the bus will stop at the ranger station / visitor centre (APN) just outside of town, where you'll attend a short information briefing and be provided with some town and trail maps. You'll be shown a video on park and trekking safety and best-practice behaviours (don't light fires, try not to die, etc.). The ranger will also give you a low down on the weather forecast - ours was pretty spot on for the five days we were in El Chalten, so its worth a listen. Once you've made it through this, you jump back on the bus and you're dropped off at the bus terminal (located at the south end of town, just across the river on Perito Moreno). We booked in at Pudu Lodge at the north end of town, so we jumped in a taxi with our gear (it wasn't an official taxi, just a friendly lady who waits at the bus station to run new arrivals to their lodgings, very entrepreneurial). We liked the location of Pudu Lodge - its very close to the beginning of the Mt Fitz Roy trail, which shaves off 20 or 30 minutes of walking from the south end of town (an advantage when you're heading out at 4am for sunrise). The town itself is small (but bigger than we anticipated) and growing rapidly. There are a couple of supermarkets where you can grab some essentials, and plenty of cafes and restaurants. We were fans of Don Guerra and B&B Burger joint. The internet still hasn't really arrived in El Chalten in any big way, and the connections are often relatively poor given they're all satellite connections. The best wi-fi (and friendliest staff) we found was in Cafe Lo de Haydee on Lago del Desierto. The two principal medium-distance trails in El Chalten are the Fitz Roy / Laguna Los Tres trail and the Laguna Torre trail. Both trails will eventually take you to a lagoon near the base of their respective peaks. Two shorter trails that provide great views are the trail to the Mirador Los Condores, and the trail to Chorrillo del Salto. Simplified trail and mirador map. You can see clearly on the map the two principal mountain chains of the region - the Cerro Torre massif to the east and the Fitz Roy massif further to the west. The Fitz Roy trail (Sendero del Fitz Roy as it will be labelled on most of the signs in town) starts the north end of town. Follow the main street out past the last houses, through a car park to a large wooden gateway that marks the start of the trail. There is a large wooden map / information display which will give you can idea of the trail. The trail is approximately 9km long (18km return if you've forgotten your two-times table) and will take you 3 hours or so each way. There are kilometre markers so you can track your progress and curse at your slowness - the first three or so kilometres are uphill (only gaining about 300m, so not too bad) before the trail levels off all the way to the start of the climb up to the Laguna Los Tres. This last section of the trail climbs 400m in around a kilometre, and is tough work if you're carrying a lot of camera gear. On the walk up you'll reach a nice view point at Mirador Fitz Roy - on a clear day you'll get a great view of the mountain. If that is all you've come for and you don't fancy a walk up to the lagoon you could easily turn around here. Its also a nice place for sunrise, as its only a 90 minute walk from town. Peaks of the Fitz Roy Massif, taken from Mirador Los Condores. The Laguna Torre trek takes you out to a lagoon with a great view of Cerro Torre. We didn't get a clear view of Cerro Torre during our time in El Chalten (thats the risk you run), so I can't show you any photos or speak in detail about the end of the trail. Both Fitz Roy and Cerro Torre seem to have their own weather patterns, and even when one is clear the other is often not. As you can see on the map above, there are a couple of trailheads that connect into the main Laguna Torre trail - one each from the north, central and south points of town. The trek takes in a couple of nice viewpoints before reaching the lagoon. You'll get great views of the Rio Fitz Roy on your left after a kilometre or so, and you'll reach the Mirador Torre after around 90 minutes of walking. If its thick and foggy here, you're probably best off turning around. If its clear and you can see Cerro Torre, continue onwards. Before the Torre Mirador you'll pass the Mirador Margarita - on a clear day this has a great panoramic view of Cerro Torre and Fitz Roy. On a cloudy day like we had, you'll have a hard time picking anything out. We turned around at the Mirador Torre given the conditions. There are two shorter trails which are great if you only have an afternoon in El Chalten. If you follow the dirt road out of town to the north you'll eventually come across the Chorrillo del Salto, and impressive 20m or 30m waterfall at the terminus of the Arroyo del Salto. This spot can also be accessed by car and tax (or tour bus) and there is a large car park near to the falls. The trail to the Mirador Los Condores is a short 1.5km to 2km trail at the south end of town. You access the trail near the visitor's centre / ranger's office, which is just across the bridge near the bus terminal. You gain around 200m or 300m of altitude, and the viewpoint gives you a great vista of Fitz Roy and the town of El Chalten. This is where the shot at the top of this post was taken from. It was easy to find a photo of these falls online (and they're on postcards inside every building in El Chalten), but it was impossible to find directions to the falls online. If you've found your way to this blog post, its your lucky day. I dropped a couple of pins on my Maps.me app to remind where to find these falls (it has a much better trail map than you get in Google Maps), which you can see in the screenshot above. The first pin on the map above (on the dotted trail) is where you turn off the main trail. Before you reach this point you'll pass through some pretty narrow track sections once you're past the Mirador Fitz Roy, but the trail will begin to open up just before the turn off. From the turn-off point there are a few tracks (not as well marked as the main trail) that lead down to the river and the falls. You can't really miss it if you follow where these pins are dropped. I found Maps.me to be excellent for hiking trails in South America generally, especially in El Chalten. It was accurate and worked offline (provided you download the maps you need in advance), which is a godsend in a lot of places in this part of the world. The GPS co-ordinates for the turn off point are 49°17'48"S 72°56'07"W. These are the co-ordinates provided by the app, not by an independent GPS device, so take them as an approximate guide. I'd suggest doing a scout during the day to find these falls (you can easily do it as part of the trek up to Laguna Los Tres) before you attempt it in the dark before sunrise. There aren't really any objective dangers here through, just be careful around the water as you have to scramble on some rocks to get the best viewpoint here. So there you have it - a rough guide to El Chalten and its trails, and a guide to finding the secret falls of Fitz Roy. Good luck, and let me know how you go! Some more good news from the back-end of 2016. My image of La Paz in Bolivia has won the "South America Award" in the 2016 International Landscape Photographer of the Year Awards. It also made the Top 101 images, which means it will be included in the published awards book. Check out the major prize winners here and the full gallery of the Top 101 images here. Update: Australian Geographic has run a brief piece on the results, which can be accessed here. A brief summary of Mt Wilson from a photographic perspective. Includes a snapshot of some of my favourite spots and some example pictures for inspiration.